The lights in the cavernous room are off, but an electric glow fills the 70,000-square-foot room. The darkness dances in an erratic sizzle of colors from thousands of computer monitors, the pulsing pixels illuminating an electronic shanty town of home-built computers, neon, pillows and people. 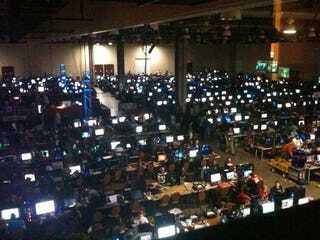 This room of humming computers, quietly clicking keyboards, and energized gamers is the throbbing heart of QuakeCon, id Software's annual fan gathering held last week in Grapevine, Texas. While the free convention, held in a Dallas, Texas-area hotel each year, sheds light on new projects in the works by the famed developers behind Quake, Doom and Return to Wolfenstein, what makes this gathering unique is it's sense of camaraderie. Gamers from across the country, and sometimes around the world, bring their own computers to the event to hook them up in a massive network and game together. It is, id Software says, three days of Peace, Love and Rockets. This year the event drew more than 7,000 people to the Dallas-area and included a more than two-hour talk by id developer John Carmack. But QuakeCon hasn't always been so auspicious. The convention grew out of a gathering of gamers in the summer of 1996 that was more pilgrimage than celebration, said id Software president Todd Hollenshead. "A bunch of guys made a pilgrimage to Dallas to see if they could get (John Carmack) to talk at their LAN party," he said. The group all gathered at a hotel in Garland, Texas a few miles from id Software. They set up an impromptu tournament and then emailed Carmack asking if he could swing by. On the last day, Carmack showed up and talked to the group in the hotel's parking lot for about half an hour. The late night parking lot chat and the days leading up to it have, over the years, blossomed into a gaming party of sorts, with tournaments, music, gaming and Carmack's annual chat. Although the event has always been held close to id Software's Texas offices, that doesn't stop a group of id developers from moving into the hotel for the show's four days so they can check in as often as they'd like on the 24-hour a day gaming. "People who come to QuakeCon are genuinely enthused about PCs," Hollenshead said. "They lug their PCs to the hotel just to play for 72 hours." QuakeCon provides the tables, the chairs, the power and the cabling to hook all of those thousands of computers together, the gamers provide everything else. "I think this is the largest free event of its kind in North America and the largest bring-your-own-computer in the world," he said. The lights in the massive gaming room go off Thursday and don't come back on again until Sunday, and some people try to take advantage of every minute of that potential game time. "There are people who will literally go down there and play until they are done," he said. "We've had instances of people who pass out at their computers. "People will bring pillows, lay them over the keyboard and go to sleep. We don't encourage that, because it's probably not the best thing." The computers, many modified into outlandish shapes like small coffins or Transformer Optimus Prime, light up the otherwise darked space. While QuakeCon is returning to its roots in some ways, it's also moving forward in others. Earlier this year id Software was purchased by the company that owns developer Bethesda Games. Last week Bethesda Games attended their first ever QuakeCon, remaining quietly in the background of the show typically dedicated to id. But that is something that could change in the future. "The potential is that we could have a bigger and more exciting QuakeCon" with Bethesda's help," Hollenshead said. It makes sense for QuakeCon to try and expand from an id-centric experience to one more broadly dedicated to PC gaming in all of its forms. The current stable of cutting-edge consoles have eroded the home computer's already failing gamer-base and groups like the PC Gaming Alliance are bringing groups together to try and draw that audience back. Hollenshead believes that as this generation of consoles age, PC games are regaining their advantage. "As consoles go into their fifth Christmas the technology advantage of the PC is going to become an important factor," He said. "It's likely over the next couple years that PC gaming will have a a bigger competitive advantage."